Summer at the clubhouse has felt much like camp over the past few weeks. Lots of foot traffic around, high energy, and though the days are longer, the assortment of activity has allowed it to feel very fast paced. Amidst the rumble, in the cooking department we’ve been able to start to execute many of the ideas that we were only able to stew over during the school year. 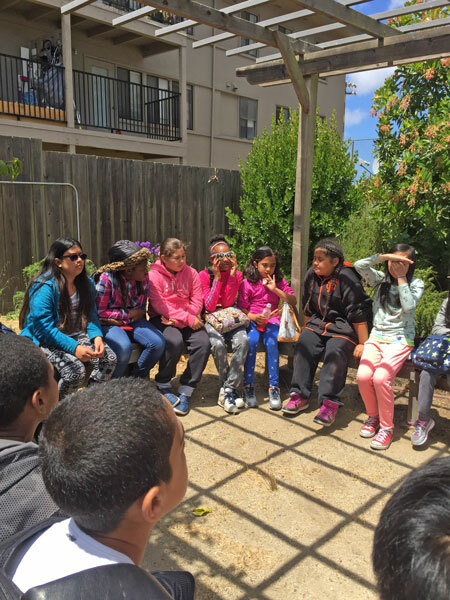 One of those being our “Cooking Around the World” series, which in the span of just over a month has allowed youth members to travel to eight different countries – from Japan to Brazil, Ethiopia, (and many places in-between). 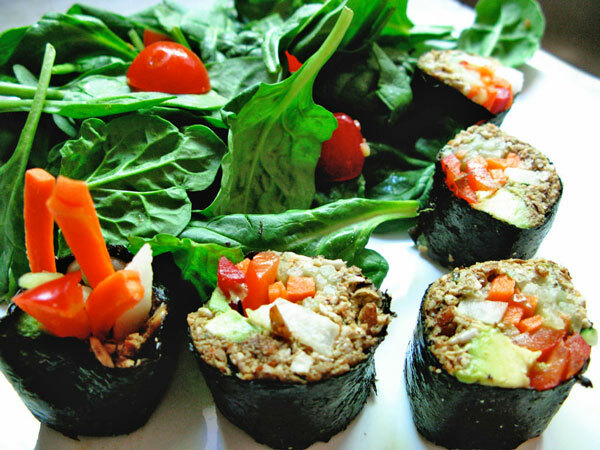 While in Japan youth members fumbled around with sticky rice and free form sushi rolls, which they rolled all by hand, customizing to their liking with various fruits and vegetables. They also had the option to use hummus on their sushi rolls instead of rice. This activity provided the perfect opportunity for youth to refine their knife skills and perfect the “julienne” cut; a popular matchstick style of cutting that proves the perfect size for the stacking and lining up of many different vegetables. 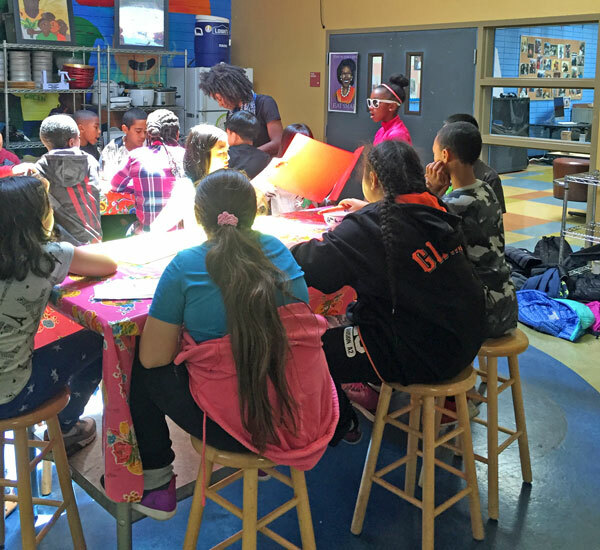 Over the month of June, we at the Edible Schoolyard have had the pleasure of inviting other clubhouses to come and join us for garden and cooking class sessions at Willie Mays. 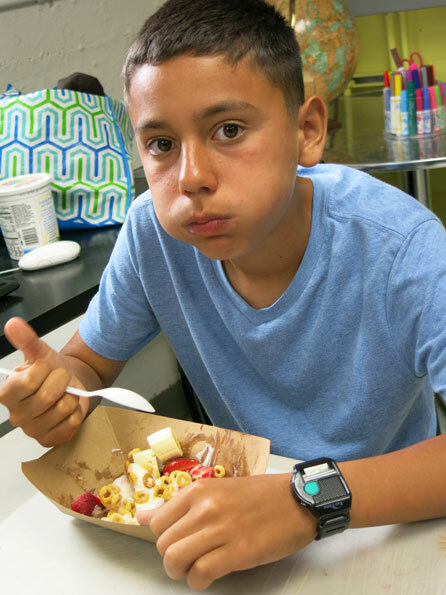 This gives clubhouse members a chance to interact with other youth and provide a welcoming space for them, as well as an opportunity to implement leadership skills in assisting with garden tours and helping visitors get accustomed in the kitchen. 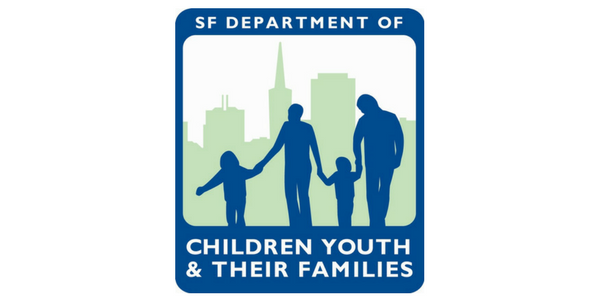 We look forward to hosting many more and inviting the broader BGCSF network to participate with us in “Cooking Around the World”. 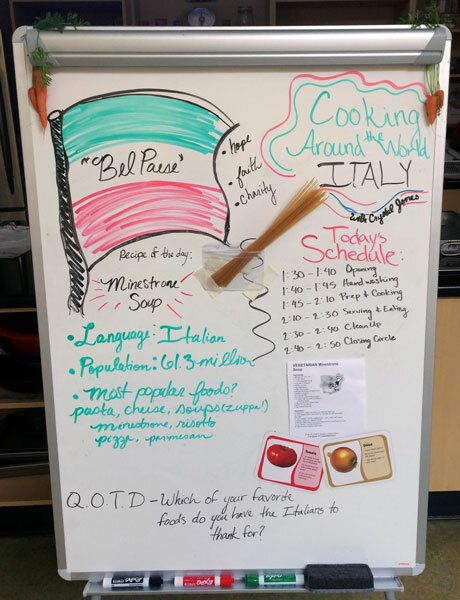 An example of our whiteboard during “Cooking Around the World: Italy”. The board is normally turned around when youth members enter the kitchen and before revealing our country of the day, students are given a chance to see if they can guess what country we’re in for the day. This is done either through the playing of a tune or by sharing facts indicative to the particular region that we are in. 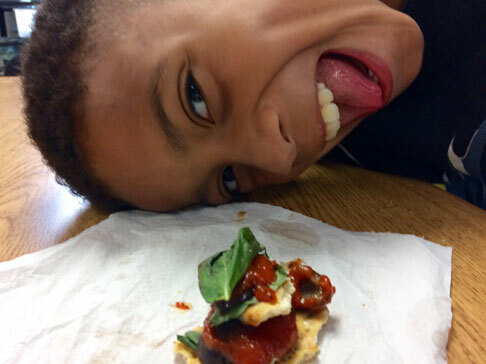 Next month we will bring our “Cooking Around the World” series to an end with a feast featuring many of the new favorite foods youth members have encountered throughout this food and people educational series. Challenging you all to explore new & favorite foods yourself this summer! Eat well.